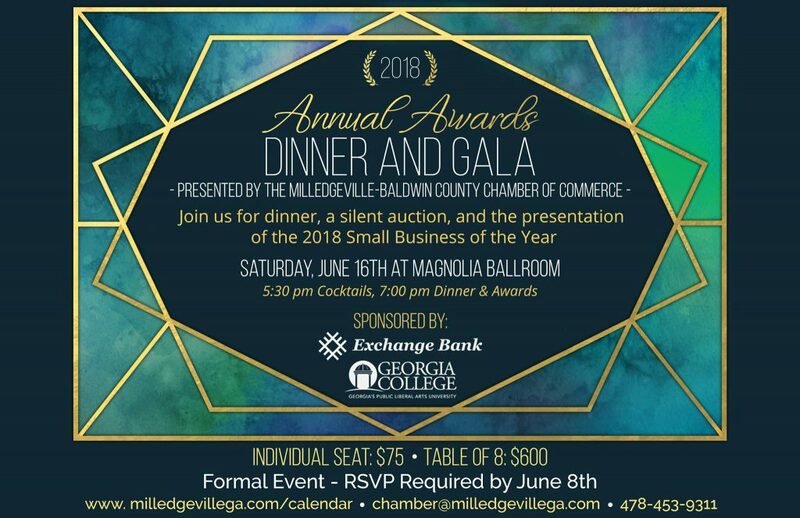 The Milledgeville-Baldwin County Chamber of Commerce will hold their Annual Awards Dinner and Gala at the Magnolia Ballroom, in downtown Milledgeville, Cocktail Hour at 6:00 P.M, Dinner and Awards at 7:00 P.M. This black-tie event features a seated dinner and the presentation of several awards, including the 2018 Small Business of the Year Award, the Rising Star Award, and more. This year will also feature a new, centerpiece silent auction between cocktail hour and dinner. Dress is formal. Individual Seats are $75, Table of Eight is $600. Register today or contact Kara Lassiter at 478-453-9311 for additional information.